Located in the Kenwood neighborhood, these modern condos are perfect for anyone who loves city life but also wants space for comfortable living. The three-bedroom, three-bathroom complex is just a stone’s throw away from downtown Minneapolis and is nearby Kenwood Park and the up-and-coming Bryn Mawr neighborhood. The first impression that you get when you walk into the $1.85 million building is that of an art gallery. The elongated front hallway and vast number of windows allow the sunshine to wash through and brighten every aspect of this embodiment of urban life. Residents can also enjoy stunning views of the Minneapolis skyline with a wall of glass in the master bedroom of each unit. Built by Kroiss Development, Inc., architecture by Peterssen/Keller, and interior design by Lenox House Designs, no detail was overlooked in the planning of these spectacular condos. 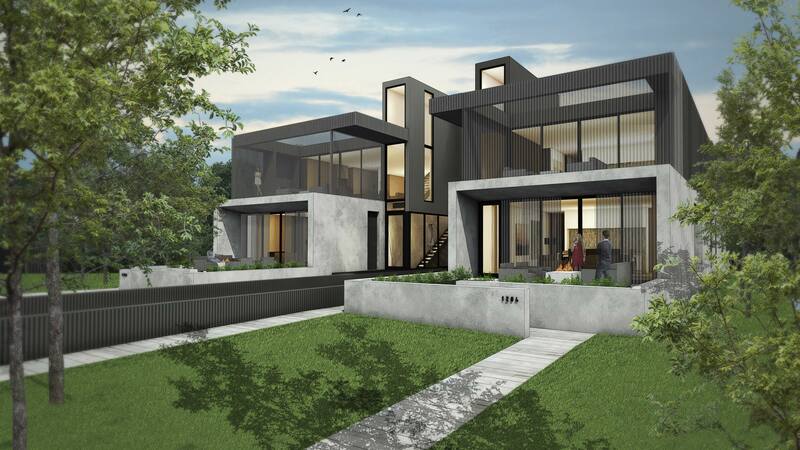 The contemporary design features an exterior of stucco and corrugated metal along with custom metal stairs, large Kolbe Vista Luxe windows that offer expansive views, Wolf – Sub Zero appliances, custom automation, and radiant in-floor heating to provide genuine comfort. Each unit has a large garage with ample storage, individual green space, and patio areas for entertaining. There is also an elevator for convenience. People that envision an easy way of living should look no further than the Kenwood Condos. With city living so close and its proximity to parks and the picturesque Lake of the Isles, you can’t find a better place to call home.